"Our results show that, over millions of years, butterflyfishes have evolved the greatest diversity of visual markings when they live in the same area as other, closely related species," said lead author and Ph.D. student Christopher Hemingson. "Crucially, we also found that this only happens when both species have ranges that are of similar sizes," said Mr Hemingson. "We were surprised to find that when one species' range is a lot larger than the neighbouring species, the pattern is reversed—with the colour pattern of overlapping species found to be less different," said co-author Dr. Peter Cowman. 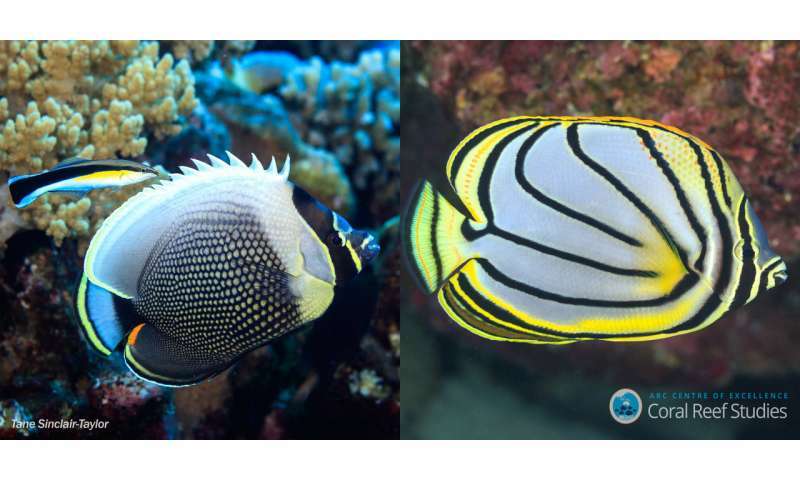 "This research is the first of its kind to quantify colour and pattern differences simultaneously among butterflyfish species. It showed us that colour pattern differences can evolve very quickly among species (within 300,000 years) but then remain stable over millions of years," said Professor Bellwood. "Colour is far more complicated than just looking different from other species," said Mr Hemingson. "These colour patterns also depend specifically on what other species are also present. It is an interesting piece to the puzzle and may help explain why reef fishes are so colourful." The paper "Colour pattern divergence in reef fish species is rapid and driven by both range overlap and symmetry" is published in the journal Ecology Letters.